Notes: (1) Click the graphic to download a free PDF newsletter on this topic. This PDF is for your personal, non-commercial use only; you must not upload it to any website, blog, file-sharing platform, or the cloud. (2) Jump to property rights of foreigners married to Filipino citizens or to property rights of foreigners living in with Filipino citizens. The Supreme Court in the August 2006 case of Elena Buenaventura Muller vs. Helmut Muller, G.R. No. 149615, clarified the issue of ownership of houses and lands by foreigners married to Filipino citizens. What is the Constitutional provision on foreign ownership of land in the Philippines? Save in cases of hereditary succession, no private lands shall be transferred or conveyed except to individuals, corporations, or associations qualified to acquire or hold lands of the public domain. The rule clearly therefore is that aliens, whether individuals or corporations, are disqualified from acquiring lands of the public domain. Hence, they are also disqualified from acquiring private lands. Note: The Supreme Court in the case of “United Church Board for World Ministries v. Sebastian” reiterated the consistent ruling that if land is invalidly transferred to an alien who subsequently becomes a Filipino citizen or transfers it to a Filipino, the flaw in the original transaction is considered cured and the title of the transferee is rendered valid. What is the purpose for this Constitutional prohibition? "Sec. 5. Save in cases of hereditary succession, no private agricultural land will be transferred or assigned except to individuals, corporations, or associations qualified to acquire or hold lands of the public domain in the Philippines." This constitutional provision closes the only remaining avenue through which agricultural resources may leak into aliens' hands. It would certainly be futile to prohibit the alienation of public agricultural lands to aliens if, after all, they may be freely so alienated upon their becoming private agricultural lands in the hands of Filipino citizens. Does the term “private agricultural lands” exclude residential lots from the prohibition? If the term “private agricultural lands” is to be construed as not including residential lots or lands not strictly agricultural, the result would be that “aliens may freely acquire and possess not only residential lots and houses for themselves but entire subdivisions, and whole towns and cities,” and that “they may validly buy and hold in their names lands of any area for building homes, factories, industrial plants, fisheries, hatcheries, schools, health and vacation resorts, markets, golf courses, playgrounds, airfields, and a host of other uses and purposes that are not, in appellant's words, strictly agricultural.” That this is obnoxious to the conservative spirit of the Constitution is beyond question. What are the exceptions to the restriction on acquisition by foreigners of land in the Philippines? What are the limitations on land ownership by former Filipino citizens? Before the enactment of Republic Act 9225 (Citizenship Retention and Re-acquisition Act of 2003), Filipinos who were naturalized as U.S. citizens were deemed to have lost their Filipino citizenship. Under RA 9255, former Filipinos who became naturalized citizens of foreign countries are deemed not to have lost their Philippine citizenship. Thus they can enjoy all the rights and privileges of a Filipino regarding land ownership in the Philippines. Can foreigners own condominium units or corporations? What is meant by ownership on the basis of hereditary succession? When the foreigner is married to a Filipino citizen, and the spouse dies, the non-Filipino as the natural heir will become the legal owner of the property. Children, as legal heirs, may also own real property. Every natural child, legitimate or illegitimate can inherit real property even if he or she does not hold Filipino citizenship. Filipinos who are naturalized as U.S. citizens lose their Filipino citizenship. Despite the loss of citizenship, they remain eligible to acquire real property in the Philippines by hereditary succession. Children born to them in the U.S. are also eligible to inherit real property even if they are U.S. citizens. ‘Hereditary succession” refers to intestate succession where the person dies without leaving a last will and testament. Transfer of ownership of land cannot be done through a last will and testament. What are the property rights of a foreigner married to a Filipino citizen? 2. When the foreigner is married to a Filipino citizen, and the spouse dies, the non-Filipino as the natural heir will become the legal owner of the property. One website states that “in the event of death of the Filipino spouse, the foreign spouse is allowed a reasonable amount of time to dispose of the property and collect the proceeds or the property will pass to any Filipino heirs and or relatives.” I cannot however find any RA or PD or Department of Justice opinion which backs up this assertion. The Constitutional provision is clear that the foreigner-spouse, in the event of death of the Filipino spouse, has the legal right to own the property. Note: What are the rights of a foreigner (and his successor-in-interest) who acquired real properties in the country as against his former Filipina girlfriend in whose sole name the properties were registered under the Torrens system? Please read the Supreme Court decision in Borromeo vs. Descallar, G.R. No. 159310, February 24, 2009. 1. Petitioner Elena Buenaventura Muller (“Elena” for brevity) and respondent Helmut Muller (“Helmut” for brevity) were married in Hamburg, Germany on September 22, 1989. The couple resided in Germany at a house owned by respondent's parents but decided to move and reside permanently in the Philippines in 1992. By this time, Helmut had inherited the house in Germany from his parents which he sold and used the proceeds for the purchase of a parcel of land in Antipolo, Rizal at the cost of P528,000.00 and the construction of a house amounting to P2,300,000.00. The Antipolo property was registered in the name of Elena under Transfer Certificate of Title No. 219438 of the Register of Deeds of Marikina, Metro Manila. 2. Due to incompatibilities and Helmut’s alleged womanizing, drinking, and maltreatment, the spouses eventually separated. On September 26, 1994, Helmut filed a petition for separation of properties before the Regional Trial Court of Quezon City (“RTC” for brevity). 3. On August 12, 1996, the RTC rendered a decision which terminated the regime of absolute community of property between the couple. It also decreed the separation of properties between them and ordered the equal partition of personal properties located within the country, excluding those acquired by gratuitous title during the marriage. Pursuant to Article 92 of the Family Code, properties acquired by gratuitous title by either spouse during the marriage shall be excluded from the community property. The real property, therefore, inherited by Helmut in Germany is excluded from the absolute community of property of the spouses. Necessarily, the proceeds of the sale of said real property as well as the personal properties purchased thereby, belong exclusively to Helmut. However, the part of that inheritance used by Helmut for acquiring the house and lot in this country cannot be recovered by him, its acquisition being a violation of Section 7, Article XII of the Constitution. The law will leave the parties in the situation where they are in without prejudice to a voluntary partition by the parties of the said real property. 4. Helmut appealed to the Court of Appeals (“CA” for brevity). The CA overturned the RTC decision stating that Helmut merely asked for reimbursement for the purchase of the Antipolo property, and not acquisition or transfer of ownership to him (and that therefore there was no violation of the Constitution). The CA further said that Elena’s ownership over the property was in trust for her husband Helmut. As regards the house, the CA ruled that there is nothing in the Constitution which prohibits Helmut from acquiring it. 5. Elena then appealed to the Supreme Court (“SC” for brevity). The SC overturned the CA and thereby reinstated the decision of the RTC which was favorable to Elena. The SC ruled that Helmut was aware of the Constitutional prohibition and expressly admitted his knowledge. He declared that he had the Antipolo property titled in Elena’s because of the said prohibition. His attempt at subsequently asserting or claiming a right on the property cannot be sustained. In sum, the Supreme Court ruled that, as the RTC had originally decided, Elena cannot be ordered to reimburse Helmut his money used for the purchase of the lot and the construction of the house in Antipolo. “What are the rights of a foreigner (and his successor-in-interest) who acquired real properties in the country as against his former Filipina girlfriend in whose sole name the properties were registered under the Torrens system?” This is the question answered by the Supreme Court in its decision in Borromeo vs. Descallar, G.R. No. 159310, February 24, 2009. 1. Wilhelm Jambrich, an Austrian, arrived in the Philippines in 1983 after he was assigned by his employer, Simmering-Graz Panker A.G., an Austrian company, to work at a project in Mindoro. In 1984, he transferred to Cebu and worked at the Naga II Project of the National Power Corporation. There, he met Antonietta Opalla-Descallar (“Descallar” for brevity), a separated mother of two boys who was working as a waitress at St. Moritz Hotel. Jambrich befriended Descallar and asked her to tutor him in English. In dire need of additional income to support her children, she agreed. The tutorials were held in Antonietta’s residence at a squatters’ area in Gorordo Avenue. 2. Jambrich and Descallar fell in love and decided to live together in a rented house in Hernan Cortes, Mandaue City. Later, they transferred to their own house and lots at Agro-Macro Subdivision, Cabancalan, Mandaue City. In the Contracts to Sell dated November 18, 1985 and March 10, 1986 covering the properties, Jambrich and Descallar were referred to as the buyers. A Deed of Absolute Sale dated November 16, 1987 was likewise issued in their favor. 3. However, when the Deed of Absolute Sale was presented for registration before the Register of Deeds, registration was refused on the ground that Jambrich was an alien and could not acquire alienable lands of the public domain. Consequently, Jambrich’s name was erased from the document. But it could be noted that his signature remained on the left hand margin of page 1, beside Descallar’s signature as buyer on page 3, and at the bottom of page 4 which is the last page. Transfer Certificate of Title (TCT) Nos. 24790, 24791 and 24792 over the properties were issued in Descallar’s name alone. 4. Jambrich also formally adopted respondent’s two sons. 5. However, the idyll lasted only until April 1991. By then, Descallar found a new boyfriend while Jambrich began to live with another woman in Danao City. Jambrich supported Descallar’s sons for only two months after the break up. 7. On July 26, 1991, when Borromeo sought to register the deed of assignment, he discovered that titles to the three lots have been transferred in the name of Descallar, and that the subject property has already been mortgaged. (d) that he acquired absolute ownership by virtue of the Deed of Absolute Sale/Assignment dated July 11, 1991 which Jambrich executed in his favor. 9. In her Answer, Descallar denied the allegation that she did not pay a single centavo of the purchase price. On the contrary, she claimed that she “solely and exclusively used her own personal funds to defray and pay for the purchase price of the subject lots in question,” and that Jambrich, being an alien, was prohibited to acquire or own real property in the Philippines. 10. At the trial, Descallar presented evidence showing her alleged financial capacity to buy the disputed property with money from a supposed copra business. Borromeo, in turn, presented Jambrich as his witness and documentary evidence showing the substantial salaries which Jambrich received while still employed by the Austrian company, Simmering-Graz Panker A.G. It is highly improbable and impossible that Descallar could acquire the properties under litigation or could contribute any amount for their acquisition which according to her is worth more than Php 700,000.00 when while she was working as [a] waitress at St. Moritz Hotel earning Php 1,000.00 a month as salary and tips of more or less Php 2,000.00 she could not even provide [for] the daily needs of her family so much so that it is safe to conclude that she was really in financial distress when she met and accepted the offer of Jambrich to come and live with him because that was a big financial opportunity for her and her children who were already abandoned by her husband. While the acquisition and the purchase of Wilhelm Jambrich of the properties under litigation were void ab initio since they were contrary to the Constitution of the Philippines, he being a foreigner, yet, the acquisition of these properties by plaintiff who is a Filipino citizen from him, has cured the flaw in the original transaction and the title of the transferee is valid. (c) ordering the Register of Deeds to cancel the titles issued in Descallar’s name and to issue new titles in Borromeo’s name. We disagree with the lower court’s conclusion. The circumstances involved in the case cited by the lower court and similar cases decided on by the Supreme Court which upheld the validity of the title of the subsequent Filipino purchasers are absent in the case at bar. It should be noted that in said cases, the title to the subject property has been issued in the name of the alien transferee (Godinez et al., vs. Fong Pak Luen et al., 120 SCRA 223 citing Krivenko vs. Register of Deeds of Manila, 79 Phils. 461; United Church Board for World Ministries vs. Sebastian, 159 SCRA 446, citing the case of Sarsosa Vda. De Barsobia vs. Cuenco, 113 SCRA 547; Tejido vs. Zamacoma, 138 SCRA 78). In the case at bar, the title of the subject property is not in the name of Jambrich but in the name of defendant-appellant. Thus, Jambrich could not have transferred a property he has no title thereto. (a) Jambrich was the source of fund used to purchase the three parcels of land, and to construct the house thereon. He therefore has all authority to transfer all his rights, interests and participation over the subject properties to petitioner by virtue of the Deed of Assignment he executed on July 11, 1991 in Borromeo’s favor. (b) The rule that co-ownership applies to a man and a woman living exclusively with each other as husband and wife without the benefit of marriage, but are otherwise capacitated to marry each other, does not apply to Jambrich and Descallar. She was still legally married to another when she and Jambrich lived together. In such an adulterous relationship, no co-ownership exists between the parties. It is necessary for each of the partners to prove his or her actual contribution to the acquisition of property in order to be able to lay claim to any portion of it. Presumptions of co-ownership and equal contribution do not apply. (c) Since the true buyer of the disputed house and lots was Jambrich (an Austrian), what now is the effect of registration of the properties in his name? It is settled that registration is not a mode of acquiring ownership. It is only a means of confirming the fact of its existence with notice to the world at large. Certificates of title are not a source of right. The mere possession of a title does not make one the true owner of the property. Thus, the mere fact that Descallar has the titles of the disputed properties in her name does not necessarily, conclusively and absolutely make her the owner. The rule on indefeasibility of title likewise does not apply to respondent. A certificate of title implies that the title is quiet, and that it is perfect, absolute and indefeasible. However, there are well-defined exceptions to this rule, as when the transferee is not a holder in good faith and did not acquire the subject properties for a valuable consideration. This is the situation in the instant case. Descallar did not contribute a single centavo in the acquisition of the properties. She had no income of her own at that time, nor did she have any savings. She and her two sons were then fully supported by Jambrich. The transfer of land from Agro-Macro Development Corporation to Jambrich, who is an Austrian, would have been declared invalid if challenged, had not Jambrich conveyed the properties to Borromeo who is a Filipino citizen. 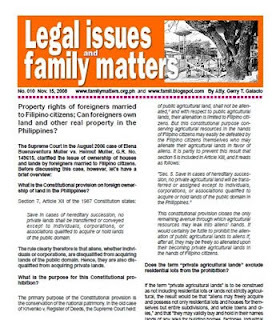 The rationale behind the Court’s ruling in United Church Board for World Ministries, as reiterated in subsequent cases, is this – since the ban on aliens is intended to preserve the nation’s land for future generations of Filipinos, that aim is achieved by making lawful the acquisition of real estate by aliens who became Filipino citizens by naturalization or those transfers made by aliens to Filipino citizens. As the property in dispute is already in the hands of a qualified person, a Filipino citizen, there would be no more public policy to be protected. The objective of the constitutional provision to keep our lands in Filipino hands has been achieved.